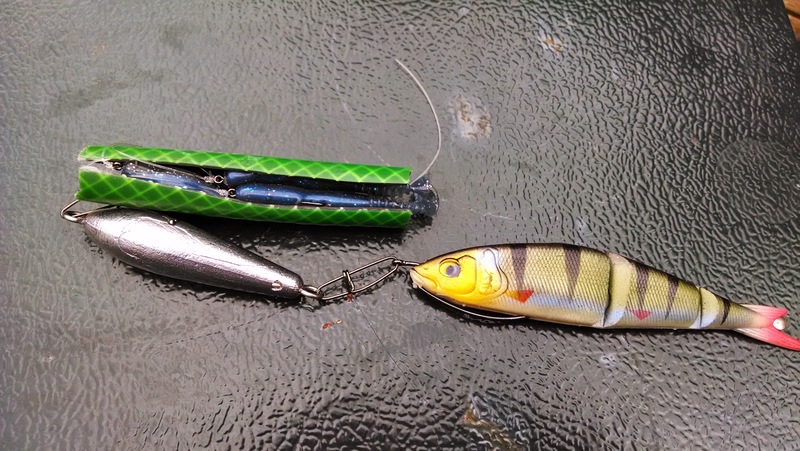 Readers of this blog will know that last I tried some experimental rigs that replaced hokkais with small soft lures known sometimes as jelly worms or paddle tails. We had already found that by replacing the traditional pirk with a big weighted shad, we caught more cod and bigger cod. But the tackle losses continued to be heavy, despite the big shads only having a single hook and generally staying free of snags. Another fat cod falls to a big 6" bottom shad. The problem was the hokkais. These themselves are a more effective replacement for the traditional cod feathers, but essentially they are the same. A single exposed hook surrounded with a bit of fluff and plastic! And having three of these on a rig means that pot lines, kelp forests and even rough ground are a recipe for snags and tackle losses. Now I don't like throwing money away as much as the rest of you. Neither am I wildly keen about littering the sea bed with heavy lead weights and the rest of the rubbish that anglers use. I thought there has to be a better way. And so there was. Last year we tried for the first time replacing hokkais with tiny jelly lures rigged weedlessly and the results were fantastic. 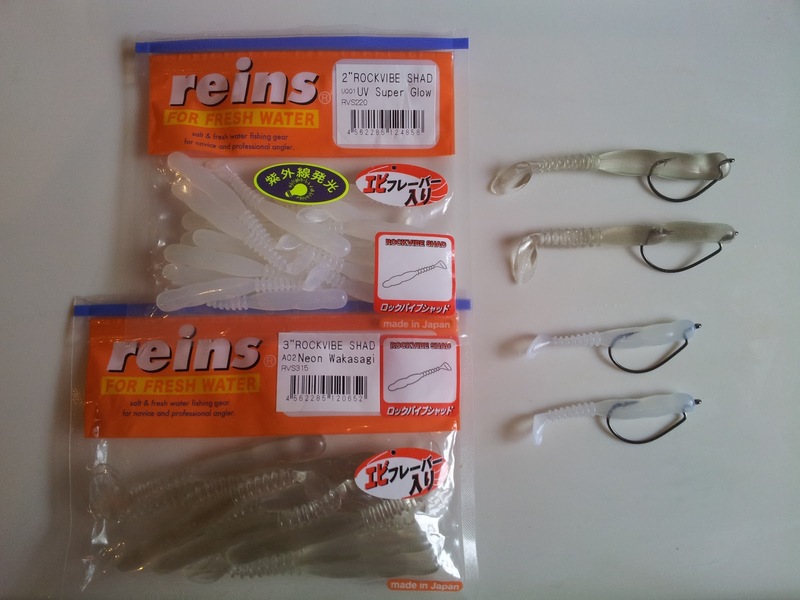 I particularly like the Reins range of small paddletails called "Rockvibe Shad". We favour the 2" and 3" sizes, but it might be possible to go bigger. Sometimes it is possible just to leave a rig of these in the current and watch your rod tip as fish try nibbling at them! Of course if let them do that too long, you'll reel in a string of bare hooks! But despite the success we had with these lures last year, we were still losing tackle to snags. This time the culprit had to be the big bottom shad. The search was on for a weedless version of the big bottom shad. Not as easy as you might imagine. Most large shads are not designed to be weedless, they're usually designed to go with a weighted head which is nearly always not weedless. Unfortunately, even so called "heavy" shads are often just not heavy enough for use on the kayak as they are not intended to be used with a string of jelly lures above them. 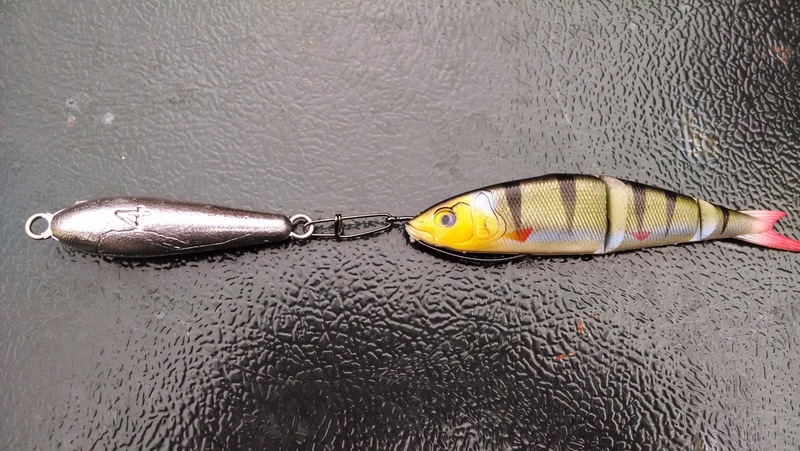 They might work ok on the their own, but when added to a rig of jellies the tide drag on a 100ft of water is considerable and means that shad needs to be at least around 100g / 4oz or more to fish the bottom effectively for cod. Luckily my sea bass fishing had taken me down the route of soft lures several years previously. Many of these originally came over from the USA and Japan where they're widely used for black bass fishing, though they'll pretty much catch anything predatory. In recent years there have been a whole slew of designs targeting European sea bass in particular. 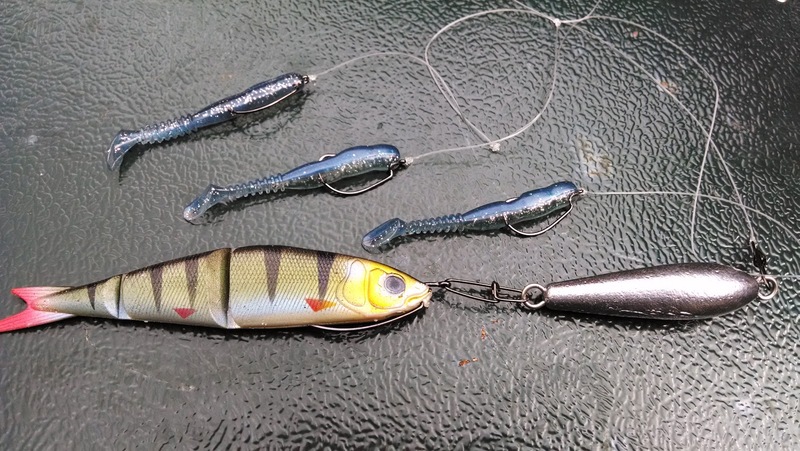 Readers of this blog will know of my recommendations relating to Fiiish Black Minnows from a couple of years back, along with Savage Gear Sandeels and other paddle tail designs that I find are safer to fish with from a kayak (no stray trebles hooks) and catch just as many fish. than about 10" (i.e bit less than shown). The Fiiish Black Minnow as we all know has become incredibly popular, despite its relatively poor casting from the shore. One of the main reasons for its popularity is the fact that it is rigged to be weedless, thus reducing snags amongst weed and rocks. 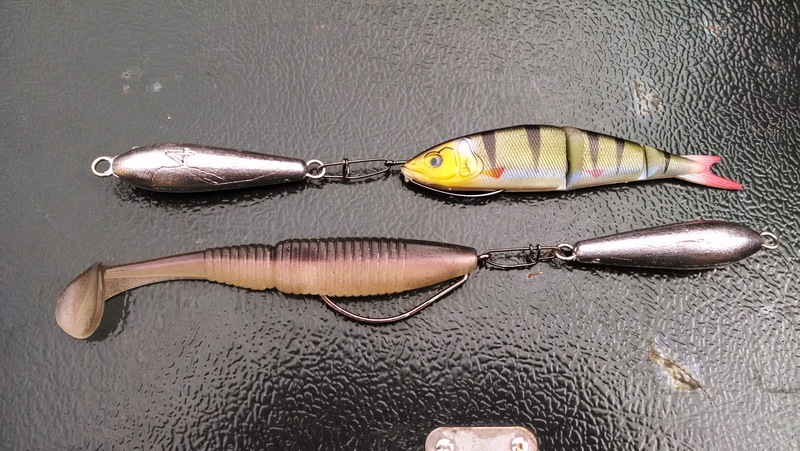 I had hoped to use the bigger versions as a weedless bottom shad for my cod rigs. The larger size, the 160mm and above, do work as single lures (though the very largest 200mm is just a bit too big for close in cod jigging, IMHO). But at 60g the 160mm just isn't heavy enough to get a rig of jelly lures down to the bottom when drifting against a strong tide. We needed something about double that! I thought about my early experiments fishing single 25g 4" shads weighted down with two 1oz bullets. It looked awful, but the cod didn't seem to mind. The answer surely had to be fish a big weedless soft lure using a decent lead weight. After much internet searching, I finally found a lead mould that met all my requirements. 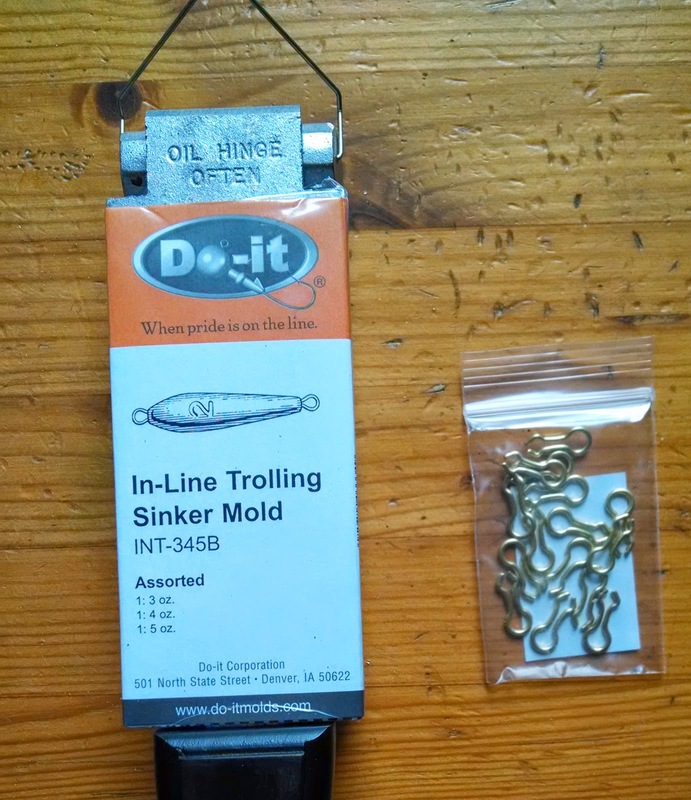 The Do-It Mold 'Inline trolling sinker' model D3139. 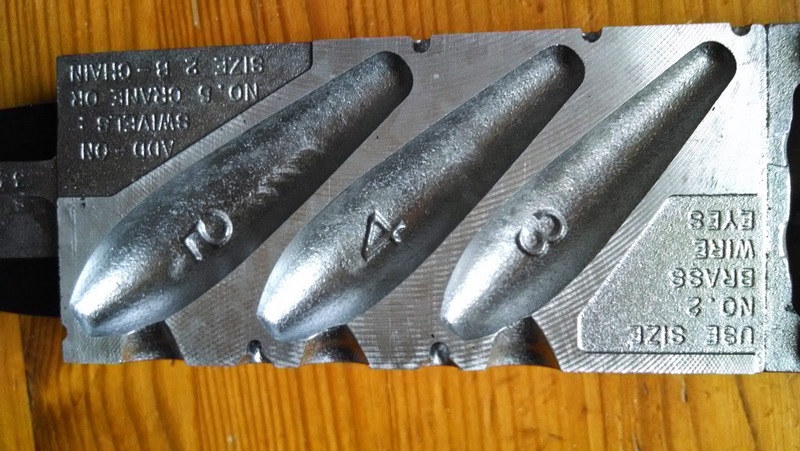 This mould casts 3, 4 and 5oz weights. All you need are No. 2 brass or stainless steel loops for either end. After an hour or so melting lead in the back garden, I had a dozen different inline sinkers to try out. The next task was to find some big shads that could be rigged weedlessly. To be honest, this has proven much harder than I thought it would be. 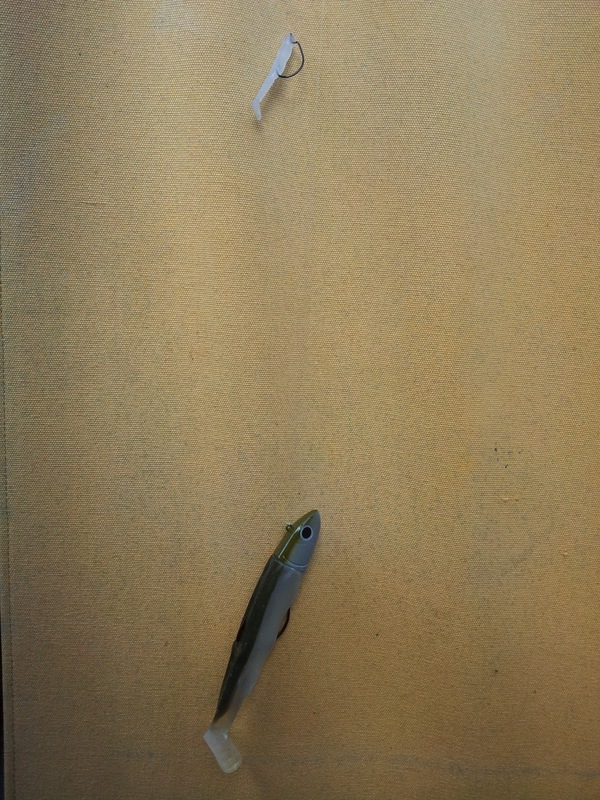 A decent sized shad for large cod is around 6" / 150mm. You can go longer, particularly if you use a sandeel or launce imitation. In that case, anything upto 200mm is probably OK, though there is an upper limit with regard to hook size. If the lure gets too long, then you find that it's difficult to purchase the right shape and size offset hook. Tight lines for the coming season! Nice work, very interesting setting! I would only change one thing, i would put the swivel on the fittest part instead of the largest part to make it work better when pulling up and down. Yes, I forgot to mention swivels, thank you! These are just the early ones and I didn't have any swivels the right size. I now have two packs of crane swivels in size 1, so the next lot of weights will have those on the heavy end of the weights. Glad you like them. They do look good, I must admit. And I know that cod love jelly lures! Tetra fish are fussy fish to keep. They come from South America and do best in peaty kind of water. You really should go to a fish aquarium store and get some good advice from professionals. Bettas (Siamese Fish) are definitely easier to look after. How about considering females this time instead of a male. Females are now bred with interesting colour patterns. Uncle Gus wants to move to Boise now and want to know when the Callie-Men interviews are? For Starters, he was born about 1960 ...but he's only 24 . ( dad ) oh! P.S. : He does not keep girlfriends for long if they can't fish ! And he's 5'9" and being from Texas ...that's a tall 5'9" almost 7ft. Interesting article, much in line with my most recent experimentation. On my 50lb mainline I tie a strong swivel. At the other end of this swivel I tie a 1m length of a 30-40lb line containing the following (in the order down from the swivel and towards the hook): 2x5mm lumi beads, 1x3oz drilled lead ball weight, 1x8mm regular red bead, a weedless 4/0 hook with a 6" sidewinder eel. When fishing, I first hit the bottom, then wind my multiplier 5-10 times and gently lift and drop every so often. I have only tried this once, at the end of my last trip, and to my great amazement caught 2 good sized cod. I've not been out to re-confirm since due to weather!